How are you celebrating Dementia Action Week this year? Varsha Thakrar, an Information and Advice Support Worker at the Carers Trust Heart of England, has recently won a Godiva Trust - Women of Achievement Award. Varsha runs the Milan Asian Carers Group, a carers group held twice monthly at St. Peters Church. Varsha proves that the job doesn't just stop at 5pm or even when you're on holiday. Varsha recently supported a group of Young Carers whilst in India. 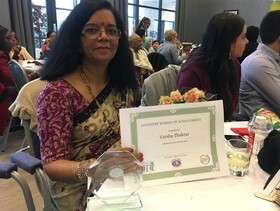 About the award, Varsha said: “I feel very privileged and honoured to receive the “Coventry Women of the Achievement Award” from Godiva Trust. It is nice to be recognised for the hard work done for the people in the community, I am sure you will all agree. I will try my best to carry on with my work and support carers and the people they are caring for and also to the people in the community as much as I can”. This year Dementia Action Week is taking place between 21 and 27 May. You may have noticed that ‘awareness’ has changed to ‘action’ and our call is to invite people to get involved and help to make Coventry a more dementia friendly community. 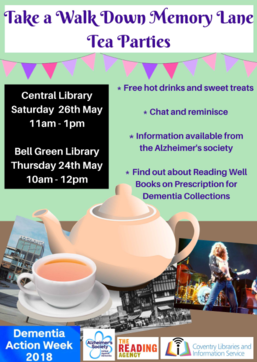 If you fancy an activity, Coventry Libraries and Information Service are holding ‘Take a Walk Down Memory Lane’ team parties at Bell Green Library on Thursday 24th May 10am – 12pm and again at Central Library on Saturday 11am -1pm. These dementia friendly events are open to anyone to pop into and are a chance to chat and reminisce about Coventry living over tea and sweet treats. Alzheimer’s Society Team members will be on hand to offer information and support and you can also browse a selection of useful resources from the Prescription for Dementia Collections. Alzheimer’s Society Team members will be available at the Information Hub in UCHW reception on Tuesday 22 between 10am – 4pm and again in Pool Meadow Bus station for the evening rush hour on Wednesday 23. They will also be at the Walsgrave Rd branch of the Coventry Building Society on Friday 25 10am – 2pm. If you or the person you care for are at risk of developing Type 2 Diabetes, Coventry and Warwickshire have developed a new way of seeking help early on. NHS organisations and local authorities in the area have partnered with ICS Health and Wellbeing to offer places on the new Healthier You: NHS Diabetes Prevention Programme to individuals at high risk. The free programme will help people take charge of their health and wellbeing, make healthier lifestyle choices and reduce their risk of developing the disease as a result. You need to be referred by your GP or nurse, or an NHS Health Check professional. After completing an initial one-to-one assessment, you can attend regular group sessions with a trained health and wellbeing coach for a number of sessions. The coach will advise the groups on healthy eating, help them to take more physical exercise and support them to maintain their lifestyle changes in the long term. The sessions will be held across Coventry and Warwickshire, including at evenings and weekends, and will benefit up to 3,500 people over the next year. June 11 marks the start Carers Week. If you or your agency are planning an event or celebration, have a suggestion or want to know how you can be involved we'd like to hear from you. Contact us on carers@coventry.gov.uk.